Revolutionizing the world, 2 feet at a time. Comfort and style wherever you go. 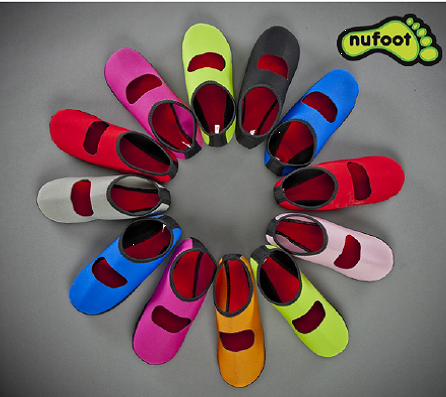 Whether you are at home, in the office, at gym, at school, or traveling, Nufoot is the perfect companion for your feet. Made with patent-pending technology, Nufoot is water-resistant and yet breathable, yuck-proof and oh so comfortable, Equipped with anti-skid soles, Nufoot is great for all indoor surfaces. Four-way stretch material accomodates all feet shapes and sizes. Machine-washable and Anti-microbial too! Home - Lounging around the house, reading your favorite book, working in the the kitchen, garage or garden. Office - Kick off those high heels or patent leather loafers and slip on your Nufoot while walking around the office. They are comfortable AND stylish. School - Nufoot are dorm essentials. After a full day of classes, put on your Nufoot and go play! Be the coolest member of your study group; be the envy of your ultimate frisbee team. You are protected from yucky hallways and common bathrooms in the dorms. Gym - Put on your Nufoot for that barefoot feel, for that minimalist running experience on the treadmill, for YOGA, Pilates, or dance. The best part is that you can zip through the gym to the shower in your Nufoot and be protected from dirt. 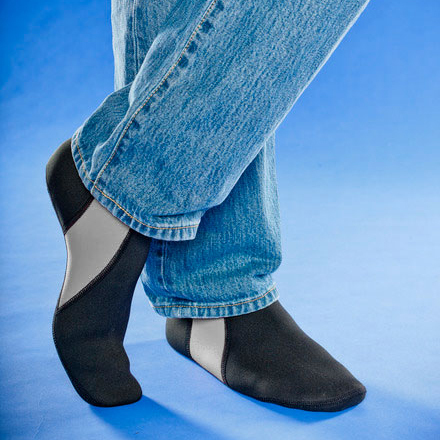 Hospitals - Nufoot is the next generation patient footwear. Water-resistant, anti-skid, flexible, and washable, Nufoot is the ideal footwear for patients in hospitals, clinics, and long-term care facilities. Travel - Going through airport security is now a cinch! While inflight, you can stretch out your feet in the comfort and warmth of your Nufoot. At the hotel, you can walk around from your room to the pool, to the gym, all in the comfort of your Nufoot. Prefilled with the most popular colors, styles and sizes. The Nufoot display case is ready to go as soon as it arrives. It can stand alone at the end-cap or in front of the cash register. It can also be hung on a wire rack. for 'Commercial Pricing'Ask us about quantity discounts!